It’s no secret that I love a good few hours in the kitchen preparing a dish. Alas, not everybody has the time or the love of cooking – for many, cooking is merely a means to and end. However, this doesn’t mean you have to abuse your stomach and taste buds with pre-packaged microwave meals or just the contents of a tin. 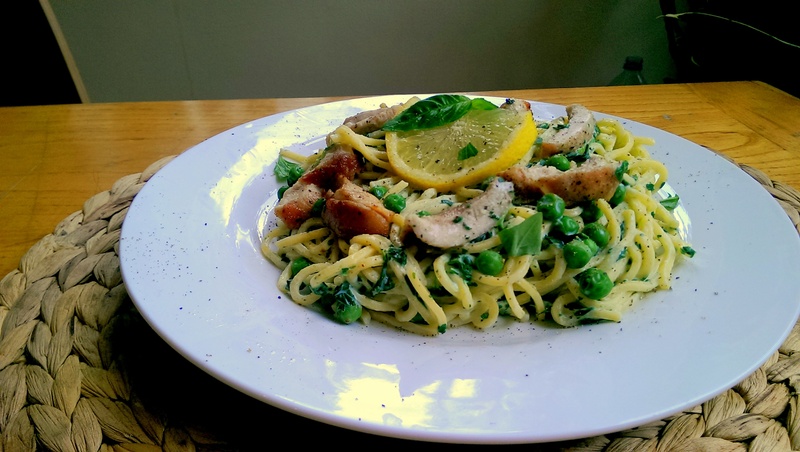 This meal is fresh, flavourful and ready in ten minutes (15 if you use dried pasta). And economically it makes far more sense, with the ingredients for 5 portions or so costing about half that of 5 ready meals. 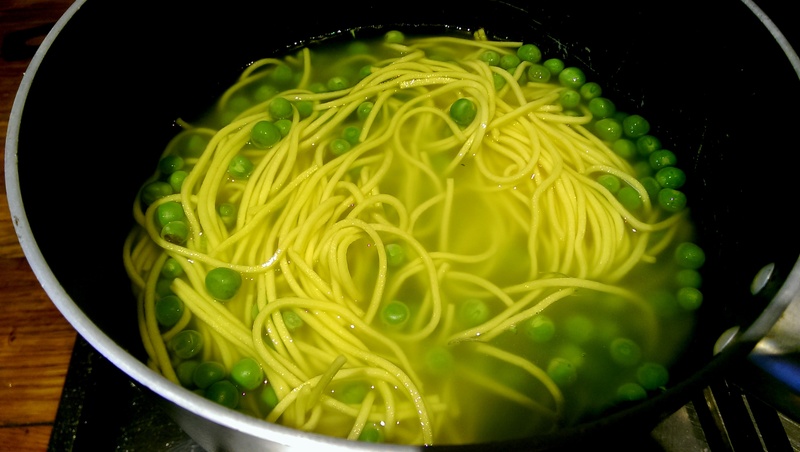 Any extra vegetables you have around – I used peas to add to the green power. 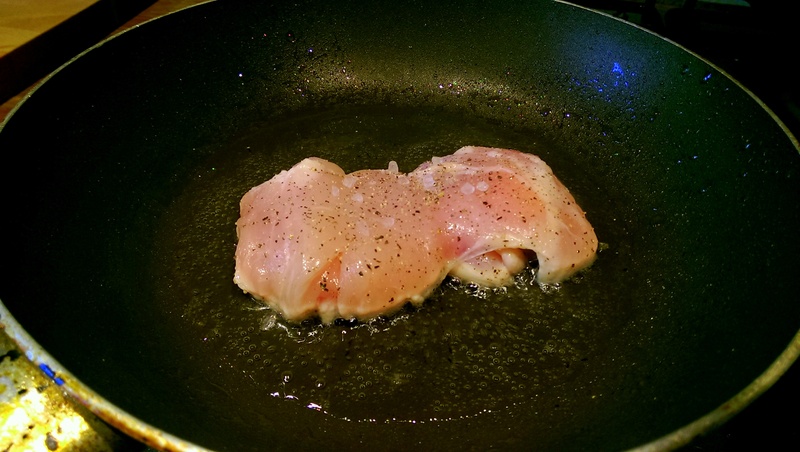 Heat some oil in a pan and begin to fry the chicken, seasoning well. I opened the thigh up and fried it as one piece because I like the crisp coating it gives the finished product. Feel free to pre-cut. If you’re incorporating frying vegetables such as onions or peppers, fry with the chicken. While the chicken cooks, put the pasta and any extra vegetables onto the boil and leave simmering. 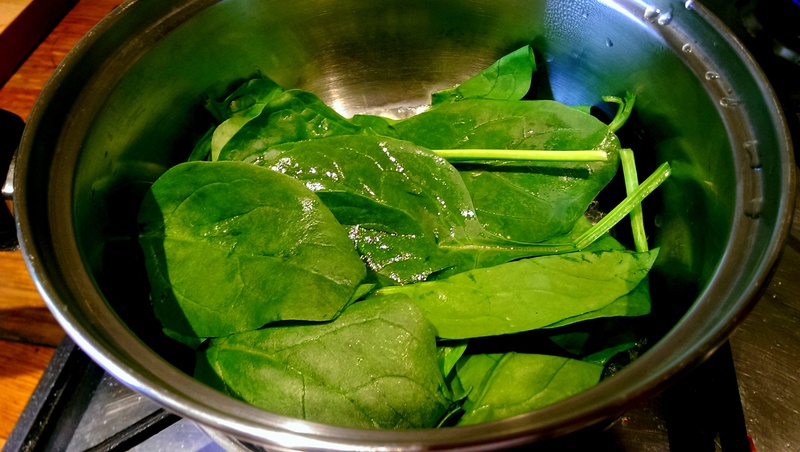 Cook the spinach over a medium heat with a tablespoon of water. Stir for a minute until it has become very moist small. Just so it activates the flavour but doesn’t seep it all out into the water. Drain the water into the pasta pot to add a little flavour. 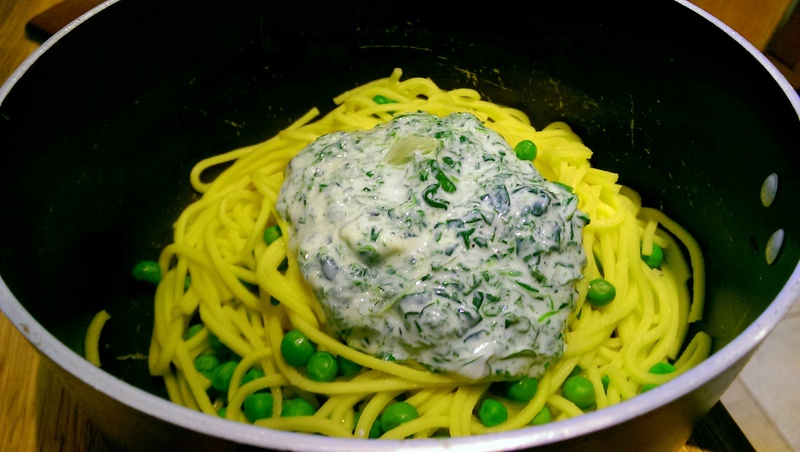 Blend the spinach, fresh herb and cream cheese together. 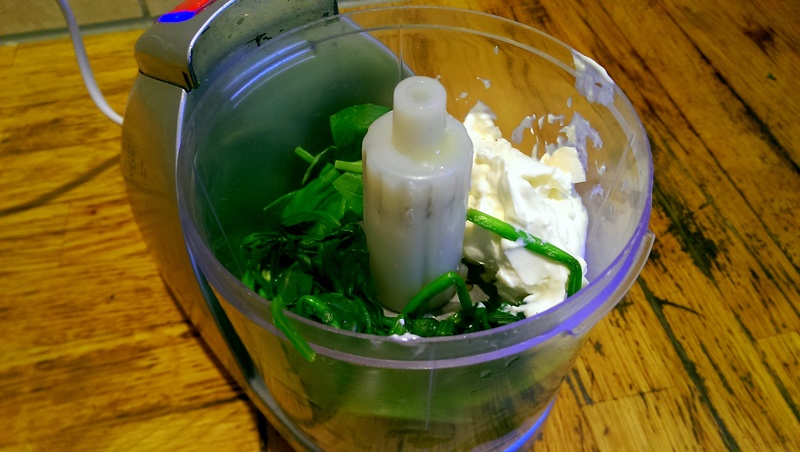 If you don’t have a blender loosely chop the spinach and herbs by hand and stir through cream cheese. Drain the pasta, add the spinach-cream cheese and combine thoroughly. Taste and adjust seasoning and acidity with a squeeze of lemon/lime or a splash of vinegar. If the chicken isn’t already sliced, do so and add to the pasta, either combining in the mix or placing on top. Serve immediately with some garnishes of the herb of choice and a small slice of lemon/lime for the eater to add at their discretion. Posted in Guesscipes, Mains, PoultryTagged chicken, cooking, cream cheese, dinner, easy, fast, fresh, guesscipe, healthy, lunch, pasta, quick meal, recipe, spinach, vegetablesBookmark the permalink.